Despite both being considered as prime candidates to secure European berths, Europa League and Champions League respectively, both sides recent form was more akin to that of relegation candidates. Levante began this weekend in ninth place with Malaga in fourth but both sides have lost momentum recently. Levante have lost five of their last seven games whilst Malaga have just one league win in 2013. Indeed, Malaga’s form becomes even more sketchy when you consider they have collected just six wins in their last 21 leagues games. Their Champions League form vastly overshadowing performances on the domestic front. Yet, as with recent seasons, the fight for European spots is increasingly turbulent with positions changing frequently. With the financial problems at Malaga and the loss of another key performer in Monreal, the sight of Baptista making his first start in 16 months offered encouragement. In attack, Malaga have no concerns over options. It’s defensively where there are frailties. Sergio Sanchez was forced to start in central defence with Lugano not fit and Weligton not in the squad. Antunes was used at left back. Yet this makeshift defence coped and helped Malaga to a valuable win. The standout performer was, yet again, Francisco Alcoron a.k.a Isco with his two goals being enough for the visitors to take the three points home. 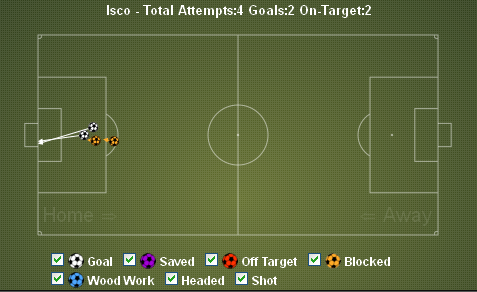 The graphic above shows Isco’s shots at goal. All are taken centrally and all are around the edge of the penalty area. Despite making passes across the entire width of the pitch, Isco’s awareness to pick out a team mate in better positions prevents him taking speculative shots from around the box. A recent improvement in performances coupled with two positive results led some to believe that reports of Athletics decline under Bielsa had been greatly exaggerated. The 3-0 home win over Atletico were the Basques produced their best display of the season was followed by a strong comeback away to Valladolid to recover from two goals down and claim a draw. Unfortunately, the Basques resorted to type this season with a capitulation at home to los pericos. Athletic dominated possession as per usual with a staggering 70% but were repeatedly cut open by Espanyol on the break during a dreadful second half performance. A failure by Athletic to create clear openings and poor finishing left them goalless. The visitors recorded just five shots on target but scored with four of them. Verdu’s penalty save by Iraizoz being the one shot on target which they did not score with although the midfielder slotted home the rebound. The graphic above shows the shots on target. All were central and extremely close to the goal. 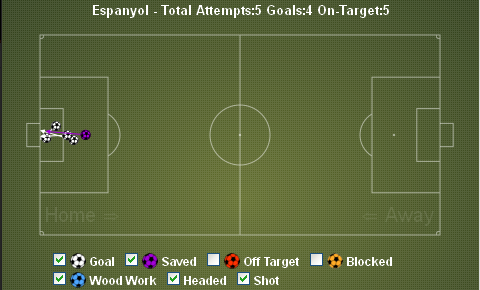 When Espanyol counter attacked, it was too easy for them to create an opening against a stretched Athletic defence. Javier Aguirre’s record at Espanyol since taking over from Pochettino is very impressive five wins, four draws and one defeat from his ten games in charge, lifting Espanyol from bottom position and leapfrogging their hosts into 13th place. There is something wonderfully refreshing about Rayo Vallecano. Their small, ramshackle ground with three stands and neighbouring tower blocks overlooking the pitch. The fact their fans are some of the most fervent in the division but probably because they deliver a brand of high energy football with a mixture of journeyman players and youngsters full of potential on the smallest budget in the league. Rayo now have six wins in their last eight games and only a 94th minute strike from Falcao stopped them from securing their sixth clean sheet of the league season. It’s a fantastic achievement and one which has taken them to the brink of a European place but fans will recall last season when a dreadful run of form saw them far too close to relegation on the final day. That should not be replicated. 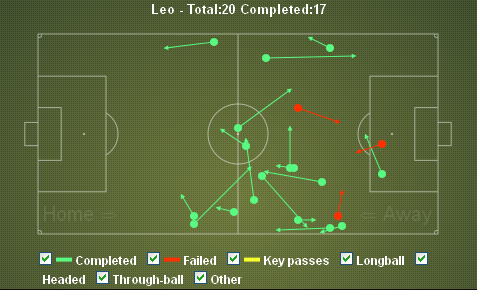 The graphic below shows Baptistao’s passes against Atleti. With repeated rumours that he will join Atleti in the summer, what better way to showcase his talents? His movement around the pitch created problems for Atleti and enable Rayo to overload Atleti in midfield. Despite trailing 2-0 following goals from Lass and Baptistao, Atleti did not change their outlook during the first half. Their conservative position remained the same and only began to alter after half time. Is Simeone adopting too conservative an approach in away games? Does el Cholo fail to react to falling behind? Atleti’s fifth away defeat of the campaign and their lead over neighbours Madrid has been cut to just four points. What must be concerning Simeone is that Atleti have not won on the road since an away win over Granada on the 18th November 2012. Since that win they have played five away games and only collected a solitary point away at Mallorca. Their second place in the table has been built upon their tremendous home form at the Calderon. Real Madrid bounced back from their surprise defeat away to Granada last weekend with an emphatic 4-1 home win over an insipid Sevilla side. Whether Mourinho would have preferred a more testing game prior to the Champions League clash with Man Utd is a worthwhile consideration. Mourinho made a number of changes to the side ahead of the European encounter with Man Utd. Alonso and Varane were rested as they continue to nurse minor injuries. Ozil and Khedira were on the bench providing a rare start for Kaka ahead of a midfield pairing of Essien and Modric. This should have been a challenge for Madrid. With one eye on the Man Utd game and with the league effectively gone, this would be Sevilla’s chance to complete a league double. Instead, the Andalusian’s failed to grasp that opportunity. Theirs was an insipid performance, defending meekly and offering little in attack. Questions persist for Madrid around midfield where Essien looks limited with his poor mobility being a problem. Modric, meanwhile, is still unable to grasp a game and dictate it. It’s why on Wednesday evening Alonso, Khedira and Ozil will all start for los blancos. The opening goal from Benzema saw Coke and Fazio appeal for offside with Navarro and Spahic both in deeper positions behind them. A low cross ricocheted off Navarro leaving Benzema with a tap in. Fazio produced a piece of awful defending to enable Ronaldo to score their third goal, allowing the ball to bounce and then pass him. The concession of poor goals hindering them, Manu’s fine late goal was of scant consolation. Despite the importance of the game midweek, Ronaldo was not rested. There was something inevitable about his performance, a reminder of his importance to the team. Is there anything left to say about Ronaldo? His only misfortune is to operate in the same era as Leo Messi otherwise he would surely be considered the best player in the world on a regular basis. At a time when Madrid are not playing at their best and their team performances have been patchy, Ronaldo remains a constant thorn to opponents, his ability to create chances from virtually nothing. The Portuguese secured his 20th hat trick for los blancos, his third against Sevilla. The graphic above shows his skill in producing shots from a host of positions. Provide him with space from a distance of up to 30 yards, and he will shoot at goal. His opening goal was a superb long range strike from the corner of the penalty area. Maduro offered a lamentable attempt at a tackle which Ronaldo sidestepped easily before curling the ball into the far corner of the net. His second goal owed much to the comical defending of Fazio to help create the chance before Ronaldo finished well. The final goal was the obligatory counter attack. No Madrid game seems complete without an opponent conceding a goal from a lighting quick counter attack. It arrived in the 58th minute when Kaka conceded a foul in the left back area. The resultant free kick was whipped in but quickly cleared with Ronaldo collecting possession on the edge of the penalty area. Nine seconds later, he had his hat trick and Madrid’s fourth goal. This quality to turn your opponents strength into their weakness during transitions has always been a key feature of Mourinho’s teams but none have managed to perfect it like Madrid. It enables Madrid to sit deep and defend, playing in quite a one dimensional fashion at times, reliant upon the attack led by Ronaldo to deliver. The Madrid faithful were able to rest easily when Ronaldo departed after 62 minutes, free from injury and his work, and his side’s, complete. The Brazilian enjoyed a rare start and took advantage with a solid display marked not only by his attacking craft but also a willingness to undertake defensive duties. 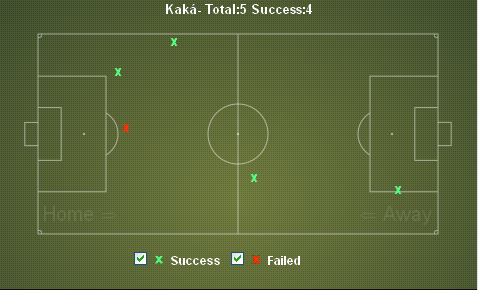 Kaka made 26 successful passes from his 29 attempted but his tackling statistics were just as impressive with four successful tackles from five attempted tackles across the whole pitch. Kaka displayed his desire to complete defensive work when he tracked and fouled Jesus Navas deep on the Madrid left earning himself a caution in the process. Whilst he will never be a starter under Mourinho and most likely requires to move elsewhere to kickstart his faltering career,this performance showed that he still has much to offer and contribute to a team. On Wednesday night, Kaka will return to the bench for Madrid. With Rakitic suspended due to his appeal failing, Emery was forced to turn to Reyes on the left of the midfield. The Croatian has provided a key element for Sevilla this season offering support to the attack and tucking into the midfield as necessary to solidify the team. For Reyes, the former Arsenal player produced a performance similar to those that have blighted his career. He offered little going forward whilst providing scant defensive cover for Navarro behind him. His performance was a contrast to that of Navas on the right. The winger offered Sevilla their main attacking outlet whilst displaying a willingness to track back and provide defensive cover. One of the few other positive performances from a Sevilla perspective was that of Kondogbia. Whilst not his best game by some distance, the 19 year old Frenchman provided further proof of his growing reputation with a solid game. With his power and physique, Kondogbia is fast becoming an important asset for the Sevilla midfield. Having arrived from Lens in France, comparisons with a previous central midfielder acquired from the French side are inevitable; Seydou Keita. And there is reason for the comparisons as Kondogbia is showing signs of maturing into a fine central midfielder. Despite only making one successful tackle and one successful interception, his ability to drive forward with the ball was in evidence particularly in the central area of the pitch. As Kondogbia develops both physically and mentally, his role within the team is likely to develop. At the moment, he is often substituted in the second half as he fades and he left the Bernabeu after 77 minutes. Madrid have now gone 33 home games without defeat in all competitions, their last defeat at home being to Barcelona in the Copa del Rey semi final last season. It’s a record which they will need to ensure remains intact midweek when they welcome Man Utd to the Bernabeu in the Champions League. The recent improvement in form for Sevilla under Emery ends with a thud. With two wins and one draw in his three Liga games to date, Sevilla should have arrived in Madrid with confidence but they surrendered meekly. Sevilla now have recorded just one away win in La Liga from 12 attempts this season. If they wish to move away from mid table, it’s an area which they have to address quickly. The manner of the defeat will concern Emery with individual errors in addition to collective errors. For a manager who prides himself upon the strength of the unit, that will disappoint Emery.